Greetings All. Please know that I will not be hosting adult training groups this spring. My friends at Fleet Feet Sports - West Lafayette will be hosting both 5K & half marathon training groups aimed towards spring races events. I am still offering individualized training for distances up to and including the marathon. So, if you are ready for the next stage of your training, the individualized attention you just can't get in a group setting, call or email me and we'll get started. This training program, targeted towards the 2014 Purdue Half Marathon, will provide the beginner and intermediate runner, under the direction of a certified coach, the training and tactics needed to complete the 13.1 mile distance of a half-marathon. Registration: Complete a standard Parks & Recreation activity registration form, indicating Half Marathon Training under the “Class” category. The form is available online at the Parks & Recreation Department website as well as at the Parks & Recreation office and the summer program booklet. It is also available by clicking HERE. Deliver the completed form and the registration fee to: West Lafayette Parks & Recreation, 1101 Kalberer Road, West Lafayette, IN 47906. The form may be delivered via US Mail, Drop Box or Walk-In. Also, registrants may phone in the information during regular business hours and register via the use of a debit or credit card. Park & Recreation Office, 765-775-5110, Morton Center 765-775-5120. 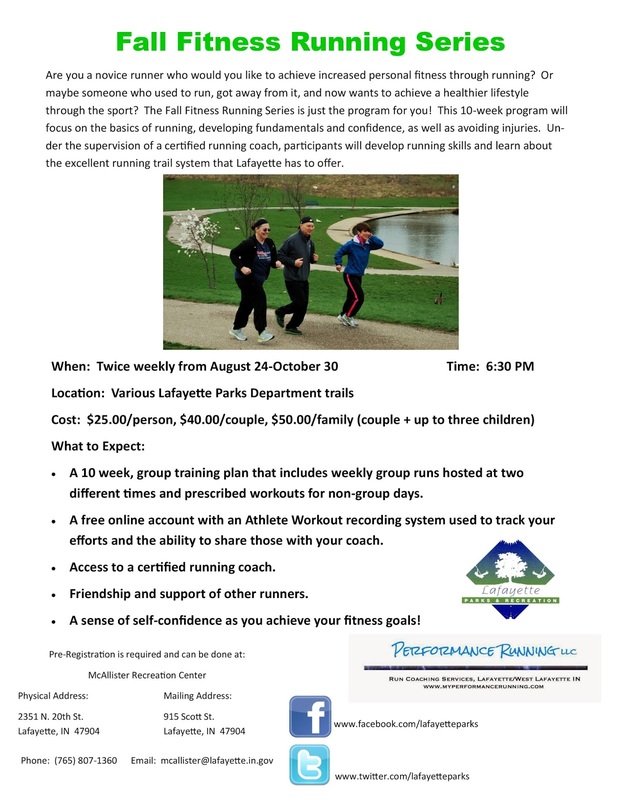 This training program, targeted towards the 5K event associated with the 2014 Purdue Half Marathon, will provide the beginning runner, under the direction of a certified coach, the training and tactics needed to complete the 5K (3.1 mile) distance of a half-marathon.